ATLANTA (AP) — Move over, Ohio. Make room, Florida and Pennsylvania. Georgia wants in on the swing-state action. 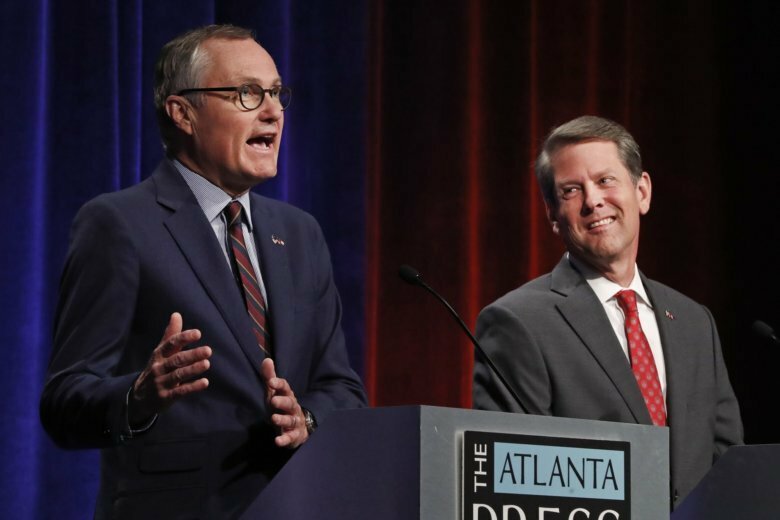 The state’s gubernatorial contest comes into greater focus Tuesday after Republicans choose between Brian Kemp, who is endorsed by President Donald Trump, and Casey Cagle, who is backed by the incumbent GOP governor. The victor in their party runoff will take on Democrat Stacey Abrams in her bid to become the first African-American woman elected governor in the U.S.
Abrams, a 44-year-old former state House leader, faces significant hurdles in a state that remains deeply conservative outside its metropolitan areas. No Democratic nominee for governor or U.S. Senate has carried the state since 1998. Bill Clinton was the last Democratic presidential candidate to win here — in 1992. Yet in the last decade, GOP standard-bearers have typically garnered no more than 53 percent of the vote. Some Republicans say that margin isn’t enough as African-Americans, Latinos, Asian-Americans and white transplants become a larger share of the electorate. The themes that will likely dominate the general election campaign for governor, including immigration and race, will help determine whether Democrats can become consistently competitive in the Deep South after years of stinging defeats. “This is a light-red state,” GOP pollster Mark Rountree said. “I don’t think Georgia will be a national afterthought for either side anymore” regardless of what happens in November, Rountree adds. A close loss for Democrats will still be a loss. “There are no more moral victories in Georgia,” says Democratic consultant Tharon Johnson. It’s time for Democrats to capitalize on demographic changes and a “talented candidate” who should have plenty of campaign cash thanks to her national celebrity, he says. Ohio and Iowa are of particular concern for Democrats long-term, given that Trump’s victory margin in both states neared double digits in 2016. That reality and Abrams’ candidacy have been enough to draw visits already from senators — and potential Democratic presidential candidates — Cory Booker of New Jersey and Kamala Harris of California. Vermont Sen. Bernie Sanders, who sought the Democratic nomination in 2016 and is considering a repeat bid, has also endorsed Abrams and told The Associated Press that he’d come to Georgia if Abrams asks. Party interest spiked when Abrams won what initially was expected to be a competitive primary in May with 76 percent of the vote. The question is whether Republicans can continue to rely on a large share of the white vote outside Georgia’s cities to ensure victory. “Predicting the tipping point is impossible … but if Stacey just tells people what she thinks, the votes are out there,” says Democrat Jason Carter, who is former President Jimmy Carter’s grandson and ran for governor in 2014, losing by eight percentage points. Since Carter’s loss, which he notes came in a midterm that was bad for Democrats nationally, Democrats have flipped several state legislative seats in the northern suburbs of Atlanta. In 2016, despite losing by five percentage points statewide, Clinton led Trump in the populous suburban Atlanta counties of Cobb and Gwinnett. No Democratic presidential nominee had done that since Jimmy Carter, himself a former Georgia governor, in 1976. Abrams acknowledges she must piece together suburban swing voters, urban liberals, young voters and nonwhites from the cities and rural areas. But she insists the way to do it isn’t by shying away from liberal policy positions — something she says Georgia Democrats already tried in losing efforts. So while she touts her deal-making with Republicans as a Democratic legislative leader, she unapologetically advocates expanding Medicaid insurance, enacting more stringent gun laws and spending more on education, job training and infrastructure. She criticizes Trump on immigration and other fronts, and she’s expressed support for scrapping Confederate monuments around the state, including the depiction of Confederate leaders on Stone Mountain. The state GOP and outside groups already have begun casting Abrams as an extremist, though most of her policy positions are not much different than Jason Carter’s. But behind that rhetoric, even some Republicans say Abrams could be a bigger threat than previous nominees.